We are pleased to announce that we have a new demo video online: Virtual Nodes. This video shows how an e-mail server can be replicated with Virtual Nodes and demonstrates fault tolerance by switching off individual replicas. Take a look at XtreemOS technical videos! Two XtreemOS video tutorials are now available online! The tutorials can teach you the basics of using XtreemOS and performing administrative tasks in an XtreemOS grid, so that you do not have to start with reading the manuals. The second tutorial is about easy and secure grid configuration wth XtreemOS operating system. As part of our quality assurance plan, we would like to collect feedbacks on the XtreemOS demo videos that are currently available on our website. You have quite probably had the opportunity to watch at least one of these videos (XtreemOS events or directly on our website), so we would greatly appreciate if you you take a few minutes of your time to complete this brief evaluation and share your feedback and comments with us. Your responses will help us continue providing information on XtreemOS functionalities and capabilities that you find most useful/exploitable. N.B. the questionnaires are completely confidential and you do not need to give any personal details whatsoever. The surveys are available till November 14, 2010. We are pleased to announce that we have another new demo video on-line: the checkpointing demo by John Mehnert-Spahn from the University of Duesseldorf. SC'10 - Comme and visit us at our XtreemOS booth! The SC Conference is the premier international conference for high performance computing (HPC), networking, storage and analysis. The XtreemOS project will be present at SC'10 at booth n°1631 (click here to see the conference floor plan). A delegation of researchers from the consortium will showcase XtreemOS: the project current achievements will be presented, especially the last advancements, software release and demos (our third release will be out in the coming days). Watch our XtreemOS promotional video! We are pleased to announce the final results of the challenge. Monte Carlo Simulation for Single-Photon Emission Computed Tomography with XtreemOS by Emanuele Carlini, Sebnem Erturk & Giacomo Righetti from University of Pisa, Italy, as the winners and the recipients of the first prize. Parallel Kriging by Alvaro Parra, Exequiel Sepulveda & Felipe Lema from ALGES lab at Universidad de Chile. specifically rely on the job deployment features of XtreemOS." - "At present grid networks are working with very trusted sites. They share limited number of resources but the trend of interconnecting different grids is evolving with the passage of time. Specially by the innovation of desktop grids the risk is very high that grid networks will also be attacked like Brute force attack, Denial of Service attack(DoS) or Distributed Denial of Service attack (DDoS) etc. Grid Security Operation Center (GSOC) is the modern security operation center specific to counter these problems in grid computing networks." - "The intended application to run over XtreemOS is the parallel kriging implementation developed in C++. The current implementation is a multi process program where all parameters and options can be configured in a XML file. Output is a file containing the variable estimations of all defined nodes. The motivation is to run the application over the Grid5000 platform and make large scale experiments in order to make performance comparisons and measure scalability of the system. We want to measure what is the larger dimensionality that we can reach using this technology." We have another new demo video on-line, again made by the TID team: "XtreemOS-MD On-Demand File Sharing demo". The Grid'5000 Spring School challenge winner is Pierre Riteau, who demonstrated the deployment of a sky computing environment based on nimbus in 31mn ! The runner-up is Marko Obrovac, who demonstrated scripts enabling the deployment of XtreemOS on Grid'5000. The script brought up an linux-ssi favour version of XtreemOS putting a virtual SMP of 156 processors online in less than 30mn. Each win an ipod touch for their entry. We are organizing a second XtreemOS summer school in Reisensburg Castle, Science Center of Ulm University, in Günzburg near Ulm, Germany from July 5th to 9th 2010. The XtreemOS Summer School will include lectures on modern distributed paradigms such as Grid computing, Cloud computing, and network-centric operating systems. The Summer School will combine lectures from research leaders shaping the future of distributed systems and world leaders in deploying and exploiting distributed infrastructures. Hands-on laboratory exercises and practical sessions using XtreemOS will give participants experience on using modern distributed systems. To present Grid applications in the domains of E-science and business. To provide a forum for participants to discuss your research work and share experience with experience researchers. The school is open to postgraduate level students (MSc, PhD) and young researchers (from technical industries, research laboratories, and academic environments) who have recently started (or are about to start) working on grid research projects. Prospective students from computer science, computational science and application backgrounds will be encouraged to apply; Basic knowledge in distributed systems is the only prerequisite. Grid newcomers and beginners are welcome, but people already involved in grid projects should also benefit from this school. The use of XtreemOS on top of Grid and Cloud computing resources will be the topic of the upcoming workshop "X-HPC, XtreemOS for providing HPC services", hosted at the Department of Computer Science by the new-born HPC center of the University of Pisa. The HPC center of the University of Pisa experiments with the latest and bleeding edge technology in hardware and software, like GPGPU technologies on ATI and NVIDIAdevices, and has been nominated the first ACER HPC competence center in Europe. The X-HPC workshop will be held in Pisa, on Wednesday 16 June, in the Gerace room at the Computer Science Department of the University. Several industrial partners of the XtreemOS consortium and of the HPC center, like Kerlabs and Ferrari Racing Division, will join the event to provide their unique expertise and viewpoint. 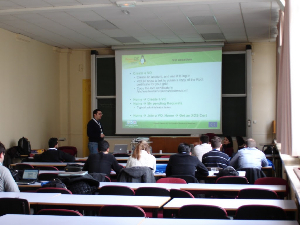 The workshop will showcase the latest XtreemOS LINUX distribution, which is currently under testing and evaluation on top of a network of computing resources provided by the Pisa HPC center, by INRIA, the Aladdin/G5K project, CNR and several other partner institutions of the XtreemOS consortium across all Europe. 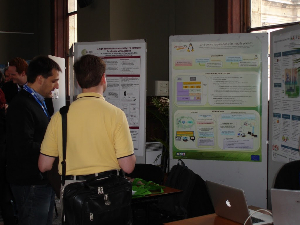 Alvaro Martinez Reol (TID) presented the XtreemOS MD flavour during the EuroSys 2010 conference (Paris, France) with a poster, demo and stand. About 30 people came and visited the stand and both the poster and demo were explained directly to around 15. Conference delegates stopping at the XtreemOS stand seemed to be quite interested, not only in the MD part, but also in learning more about XtreemOS as a whole and about specific XtremOS components (XtreemFS, XtreemOS cluster flavour, use cases...). Other visitors showed interest in XtreemOS and its possible advantages compared to other Grid solutions while others came to see the poster and GridPlayer video after they participated in the XtreemOS tutorial session. The XtreemOS tutorial given at EuroSys 2010 consisted of three parts. The first part, presented by Guillaume Pierre (VUA), gave an overview of the system and of its architecture, introducing the VO management model, XtreemFS and the Application Execution Management system. The second part focused on the usage of XtreemOS, showing how the command-line and GUI tools can be used to execute applications and to store data in a distributed fashion; the speaker for this part was Corina Stratan (VUA). 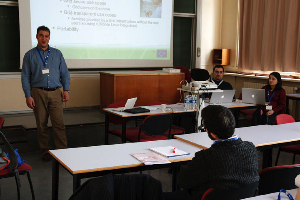 In the last part of the tutorial, Massimo Coppola (CNR) presented concepts related to the administration and security of XtreemOS, and explained how resources and Virtual Organizations can be managed. "XtreemOS, a GRID Operating System" has been accepted for demonstration at the 10th IEEE/ACM International Symposium on Cluster, Cloud and Grid Computing (CCGrid 2010), May 17-20, 2010, Melbourne, Australia. The research demo is scheduled to be held on May 19th, 2010 as a plenary from 4:00pm to 6:00pm. Please visit http://www.manjrasoft.com/ccgrid2010/ccgrid2010-overall-program.html for more details.